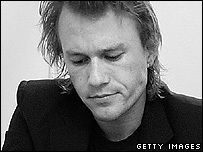 Heath Ledger's family have remembered the actor as an "old soul" in a death notice in an Australian newspaper. "You dreamed your dreams and lived them with passion and intelligent commitment," the notice published in The West Australian said. In a separate tribute, his sister Kate said that the pair were "ultimate soulmates", adding she viewed him as "just my little brother". The 28-year-old film star was found dead in his New York home on Tuesday. "We have been privileged to accompany you on a ride through life that has simply been amazing and through it all we have loved each other beyond imagination. Our hearts are broken," the death notice read. "Heatho, Beef, my beautiful boy, so loving, so talented, so independent ... so no more chess games mate ... this is it, couldn't beat you anyway. We were one, in soul and commitment, just father and son." The newspaper said the notice had been posted by Ledger's family, who were flying to the US from Australia to collect his body. Police have set up barricades outside a funeral home in New York ahead of a private viewing. The star had recently completed filming in London on The Imaginarium of Doctor Parnassus, directed by Terry Gilliam.